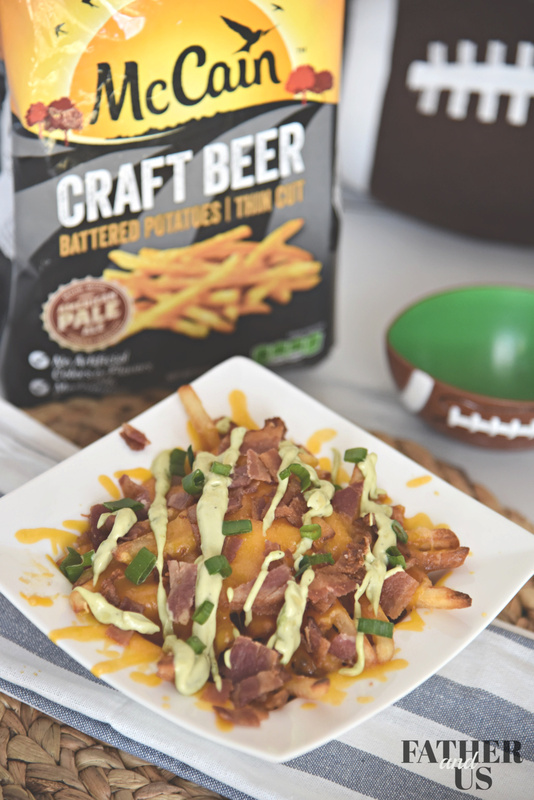 This easy loaded fries recipe is the perfect thing to elevate your game day snacks to the next level. With crispy bacon, gooey cheese and avocado ranch dressing, these loaded french fries are a sure winner no matter what the score of the game is. My wife and I have always been huge football fans. Spending lazy Sundays together on the couch watching the games has always been something we cherish. Now that we have two children, it has been fun to get them in on the action too. While my 6-year-old daughter is still a bit of a tough sell, my 9-year-old son loves hanging out with us. He always has some sort of “insight” on every play. I think he gets these insight from playing football video games! One key part of our football Sundays has always been food. We love making some tasty creations to eat and share during the action. We’ve made all sorts of delicious things in the past years. But one of my all time favorite game day foods is loaded fries. If I am out at a restaurant and I see loaded fries on the menu, I’ve just GOT to get them. I am powerless. There are just so many things to love about loaded french fries. There are so many ways you can make them and so many things that you an do with them. They are great to share or to just hog all to yourself. But, what I really love about loaded fries is that you can make them at home and they are just as good, if not better, than the restaurant! The secret to making the perfect loaded french fries recipe at home is to start with quality french fries. 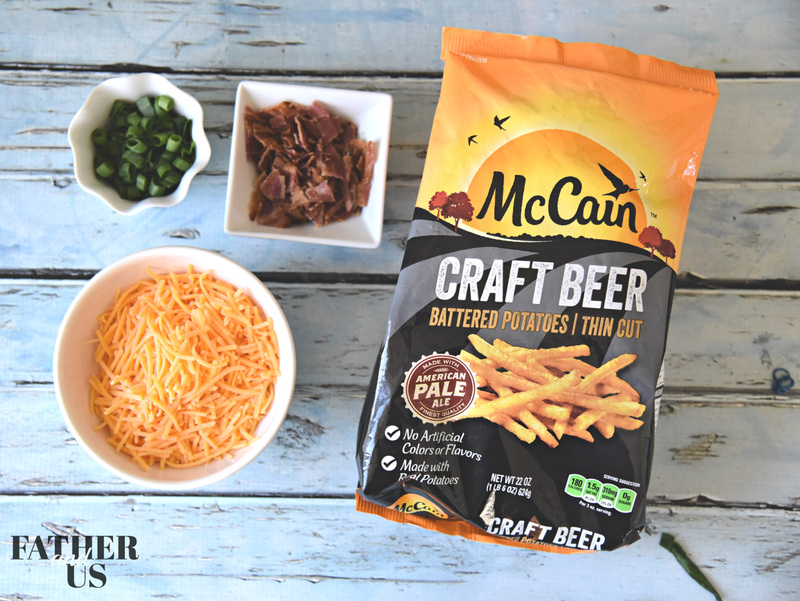 For my recipe, I use McCain Craft Beer Battered Thin Cut Fries. I love using these McCain Fries because they will be the perfect base layer to add all of my goodies on top of. 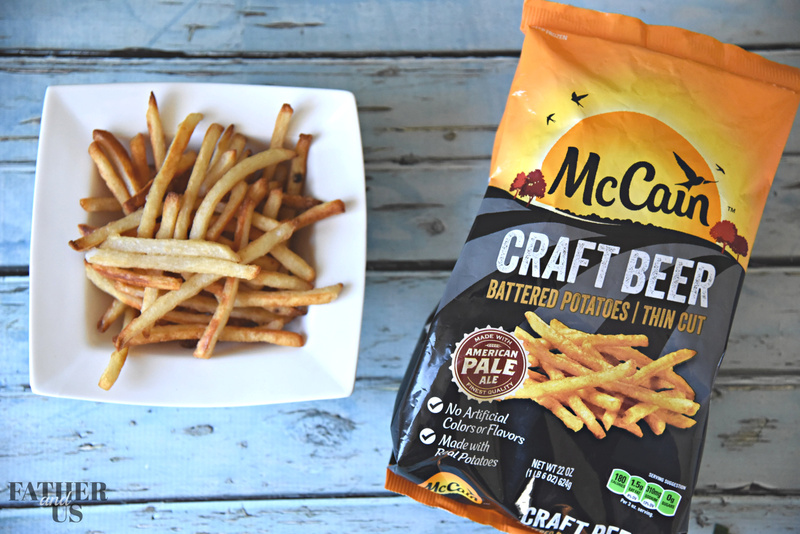 McCain foods has been delivering quality products to households and restaurants for the past 60 years. You can now find them across 6 different continents. 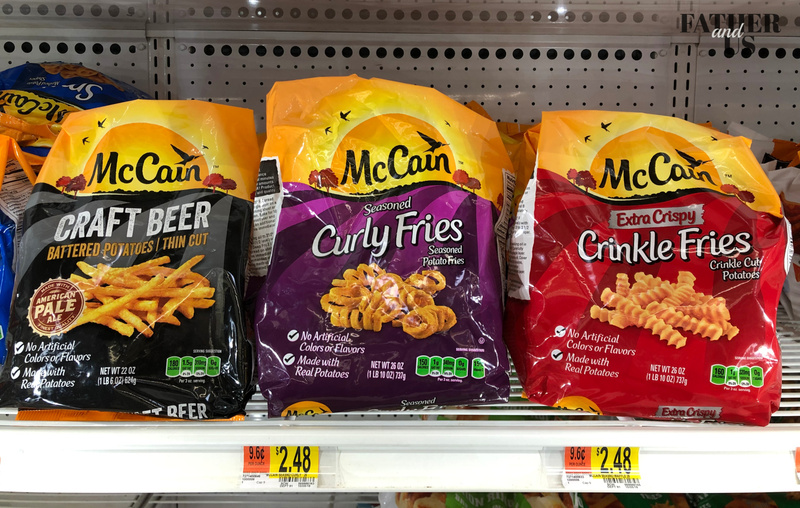 McCain has a TON of really wonderful varieties of different french fries, including Seasoned Curly Fries and Extra Crispy Crinkle Fries. I could have used any of these varieties for my loaded fries recipe. But I decided on the Craft Beer Battered Thin Cut Fries because, well, they are beer battered and that is awesome! 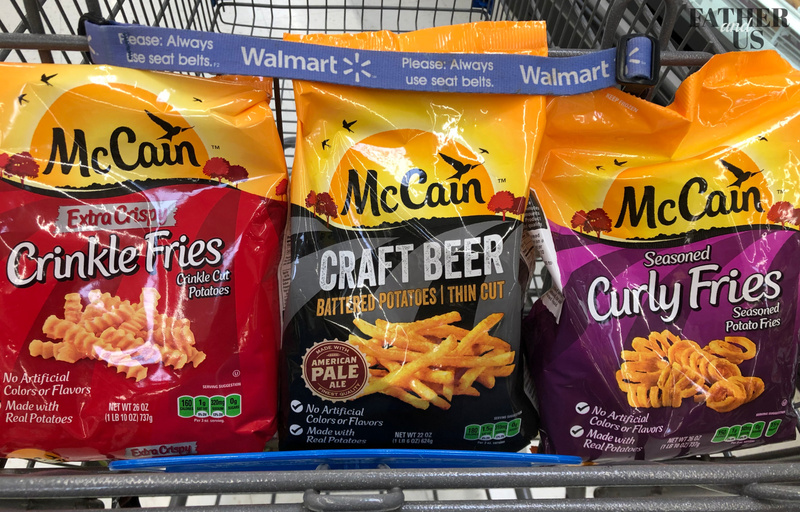 Using McCain Frozen Fries is so convenient. I know that I can always find them in the freezer section on our weekly shopping trip to Walmart. They are super easy to find in the frozen potato section of the freezer aisle. I can buy them anytime and keep them in my freezer at home until I am ready to eat them. Then, just a little bit of time in the oven and you are in “french fry heaven”. We always try to keep some McCain products in our freezer. Not only are they great for game day, they also work wonderfully and conveniently as a side item on weeknight meals! I could certainly make a homemade version of Avocado Ranch Dressing, but I’m keeping this simple and easy. I don’t want to spend too much time in the kitchen in game day. 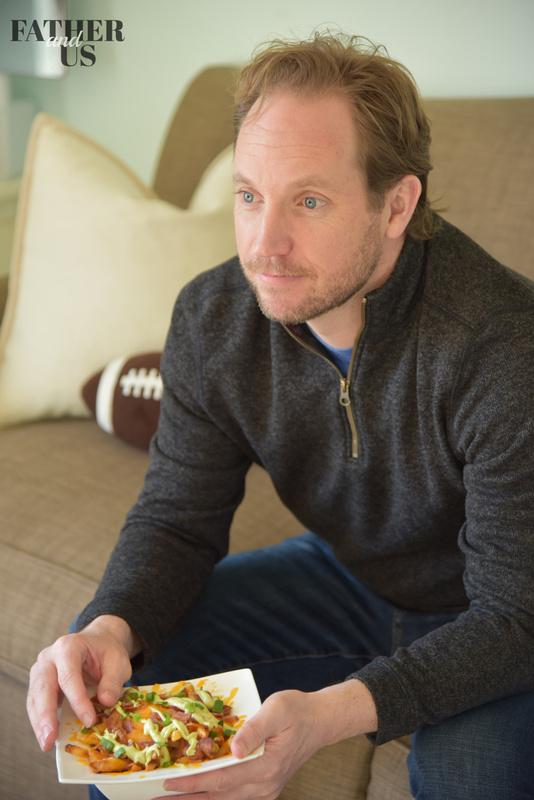 The process is super simple and you’ll be chowing down and rooting for your team in no time! Just preheat the oven to 450 degrees. Put your McCain Fries on a tray and cook in the oven for 14 minutes. After 14 minutes, flip them over and cook for another 7 minutes or until they are done. While the fries are cooking, cook your bacon on a skillet. You’ll want to make sure you buy quality bacon and get it very crispy so that it will crumble properly. I often make the mistake of taking my bacon off of the skillet too early and it is a little soft. That is ok for breakfast, but you don’t want to do that here. While both the fries and bacon are cooking, make your Avocado Ranch Dressing. This is a simple procedure. Just mix about 1/2 cup of your favorite store bought ranch dressing with 1 full ripe Avocado. Use a food processor to mix them together. Once your fries are done, but them in a bowl and top with a generous portion of cheese and put back into the oven until it is melted. While the Cheese is melting, crumble up your bacon and chop the green onions. Take your fries out of the oven and top with the bacon and green onions. 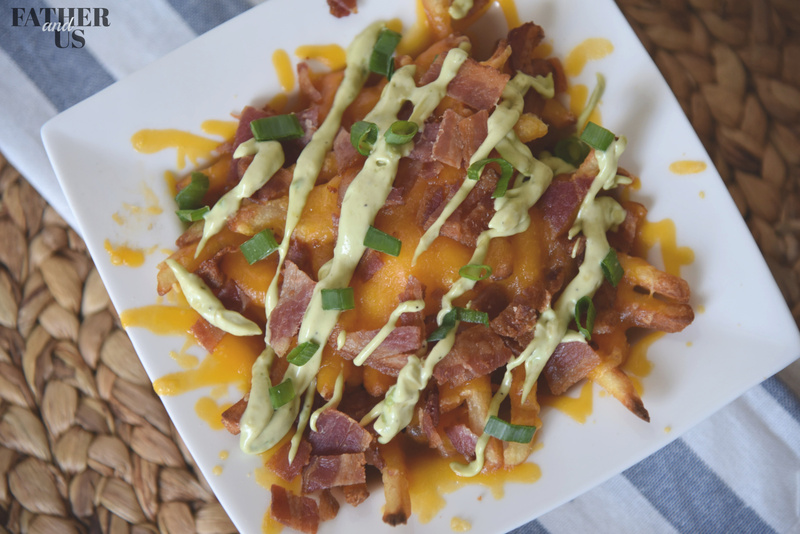 You can either drizzle the Avocado Ranch over the top of the loaded fries or put it in a small dish for dipping. Or both! These turned out fantastic. The McCain Beer Battered French Fries worked great in this dish. The batter around the french fry kept them nice and crispy on the outside, even down at the bottom of all of that cheese. This made eating this messy meal a little less messy. Not that there is anything wrong with making a mess on game day! 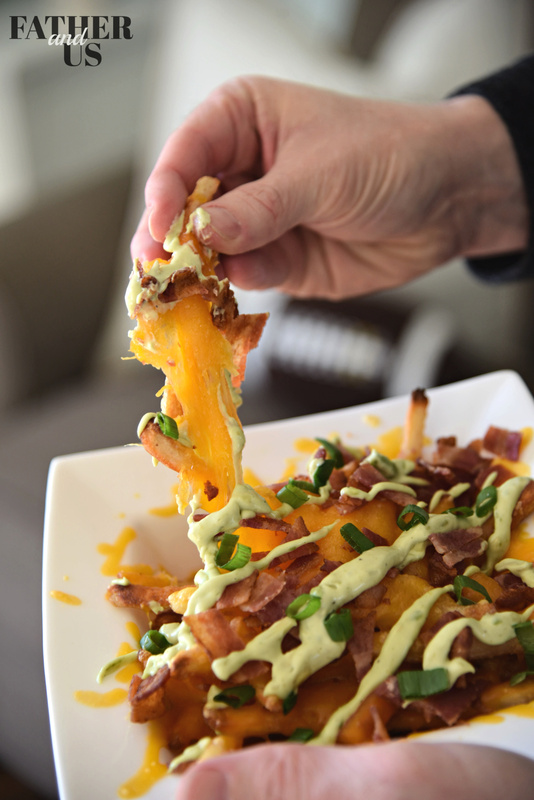 I loved drizzling the avocado ranch on the loaded fries and also have some more to dip in. The avocado ranch sauce really brought out the best in the McCain fries. If you are having friends or family over for the big game, I highly suggest making these. They are quick, easy and fun. Enjoy all the action on game day! While the fries are cooking, cook your bacon on a skillet. You'll want to make sure you buy quality bacon and get it very crispy so that it will crumble properly. I often make the mistake of taking my bacon off of the skillet too early and it is a little soft. That is ok for breakfast, but you don't want to do that here.